After almost 3 weeks with my O. latirostris, I would highly recommend them. I don't know how much individuals vary, but she is extremely active and interactive. Not shy at all. She doesn't even flinch as I clean the glass two inches in front of her face. She did go sump diving on day two, but I fixed that rather quickly. She has a tendency to swim everywhere rather than crawl... very fast and very cool! 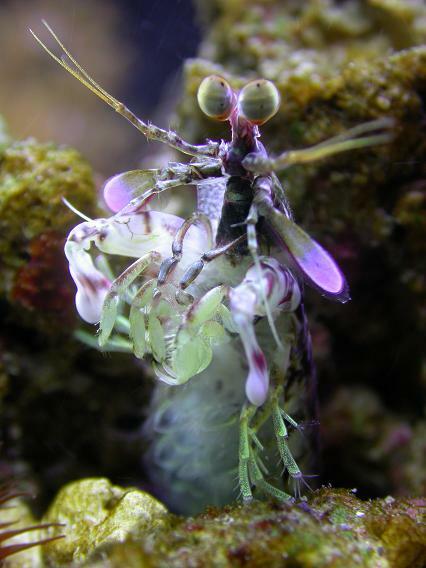 I've seen her pounce pods, saltwater mysis, and even the occassional ghost shrimp and hermit crab. She also has a temper. She was passing my pseudocorynactis and it stuck to her briefly before she jerked away. She tentatively touched it again, at which point it briefly stuck to her once more. She then proceeded to whack the crap out of it and swim back to her hole! She also likes to take out her frustration on rocks that are too big for her to swim (not roll) back to her doorway, whacking them repeatedly, presumably in an attempt to break them down into smaller pieces. She apparently doesn't like tunicates, having hidden my black sea squirt in the back of the tank out of sight (much to my wife's relief -- she claims it resembles a small dog turd) and she apparently thinks I put all of the palys on the wrong side of the tank (thankfully corrected now! ).